20 grams of non-GMO protein. Made with soy protein plus a proprietary blend of organic chia and organic pumpkin protein, Shaklee Life Shake is clinically proven to help you thrive and create the foundation for a longer, healthier life. Supports energy, satiety, and healthy weight while providing the essential vitamins and minerals to support overall health. Life Shake is non-GMO, vegan, gluten-free, kosher, and keto-friendly. With 170 calories per serving, it's a healthy base to build on. Customize your Life Shake with your choice of milk or water and your favorite ingredients, including fruit, vegetables, or nut butters. What is the Stevia Free Life Shake™? We choose stevia for our Life Shakes because we believe it's the best available zero-calorie sweetener. Since we understand that there is a small percentage of people who do not care for the taste of stevia and prefer sugar in their shake, we also offer Life Shake in a Stevia Free Soy Protein formula in vanilla and chocolate flavors. Is the Stevia Free Life Shake™ available in both Plant and Soy Protein formulas? No, the Stevia Free Life Shake is available in Soy Protein only, in vanilla and chocolate flavors. How much sugar is in Stevia Free Soy Protein Life Shake™? The Stevia Free Life Shake contains 10 grams of added sugar per serving and is still low glycemic. View more Life Shake™ FAQs. 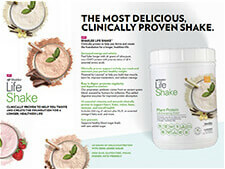 View the Life Shake™ Product Sheet. View the Life Shake™ Brochure. View the Life Shake™ FAQs.